The word “orphana” means “orphaned” and in Greek cooking, usually means a dish that can be made with meat, but in this case is made without. Cabbage is a favorite winter food, and this meatless recipe is delightful and a Lenten favorite. These cabbage rolls are delicious as a main dish, but I often make them using small pieces of the cabbage leaf, to create small rolls that are perfect as a side dish, addition to a buffet table, or appetizer. Try them also using chard leaves and Romaine lettuce leaves (photo). Make the stuffing: Combine onion, rice, tomatoes, dill, parsley, salt, pepper, cumin, and olive oil in a bowl. Prepare cabbage leaves: Remove the core of the cabbage, and stick a large fork into the center. Bring a large pot of water to a boil, and immerse the cabbage, leaving the fork in. When the outer leaves turn bright green, remove using the fork and remove softened leaves. Return to pot and repeat until all cabbage leaves have been removed. Blanch leaves in hot water until they soften and turn darker green. Remove thick stems if necessary. To use very large chard leaves, cut in half and fill each half. 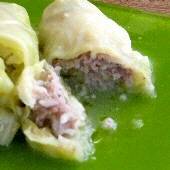 Prepare rolls: If making large cabbage rolls, use the whole leaf (or half of very large leaves). If making small rolls, tear leaves into 4 parts (for smaller leaves, tear into fewer pieces). For large rolls, place a heaping tablespoon of filling 1 inch from the thick end of the cabbage leaf. Fold the bottom over the filling, fold the sides in, and roll up. For small rolls, place 1 teaspoon of filling at one side of the leaf part, fold the leaf up over the filling, fold in sides, and roll up. Don’t roll too tightly. The rice will need some room to expand during cooking. Line the bottom of a large pot with any torn or unused leaves (and trimmed thick stems) and drizzle with 2 tablespoons of olive oil. Place rolls closely together, seam side down in the pot in 2-3 layers, as needed. Cover with a plate that fits over the rolls, turned upside down. Bring to a full boil over medium heat (it will boil with its own liquid). Add 1 cup of water (or enough to cover the rolls) and when it resumes full boil, reduce heat to low, cover, and cook at a slow boil for 20 minutes, long enough for the rice to cook. Test to make sure rice is fully cooked. Remove the plate. In a small bowl, stir the flour into the lemon juice until dissolved. Add several tablespoons of liquid from the pot and stir. Pour into the pot and shake the pot gently to distribute. Let sit 10 to 20 minutes before serving.